Each of F.P. Journe‘s ten boutiques around the world will soon have its very own Centigraphe Souverain Anniversary limited edition, available during the respective store’s 10th anniversary, starting with Hong Kong and Tokyo. 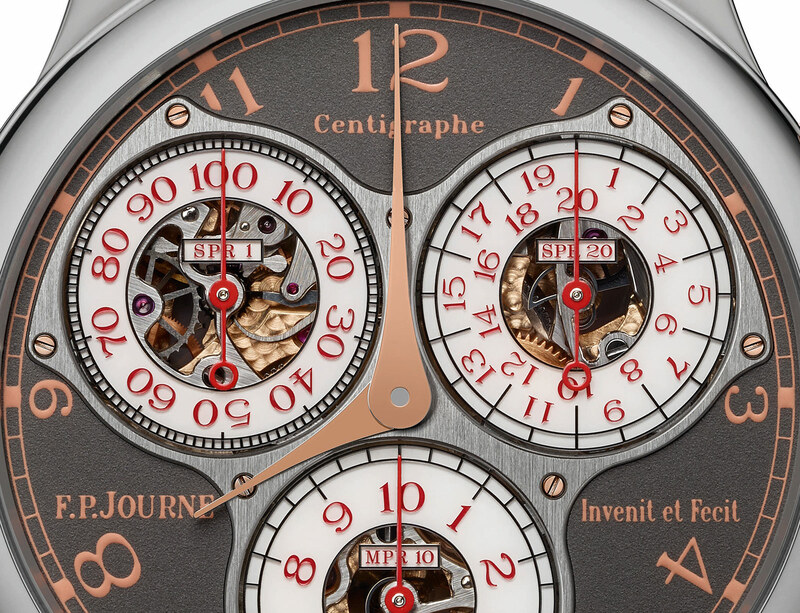 The Centigraphe Souverain Anniversary – or CTT for short – is in titanium with red gold accents, the same guise F.P. 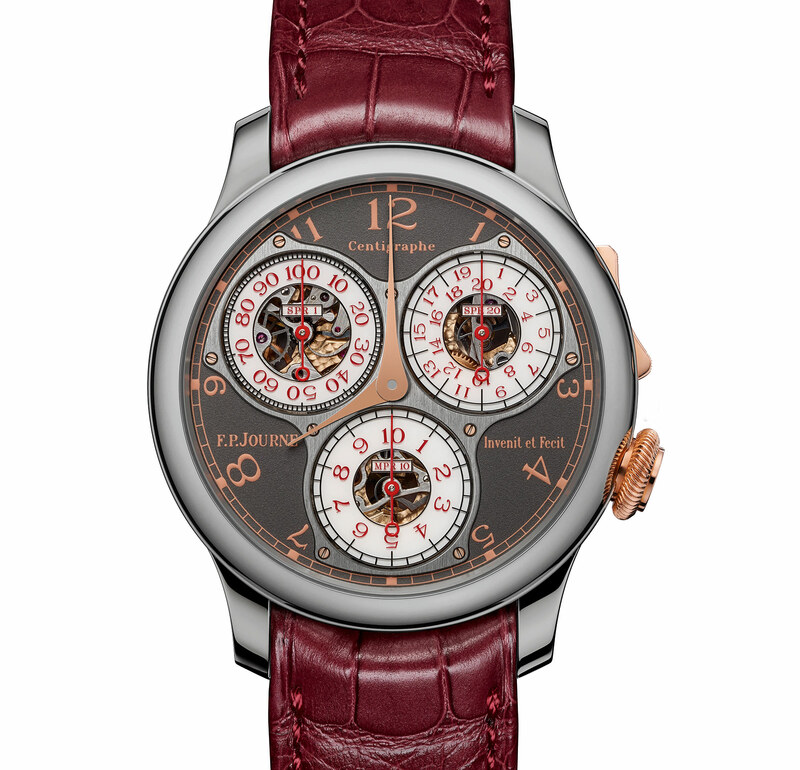 Journe applied to earlier boutique anniversary editions. Identically sized as the ordinary Centigraphe, the Centigraphe Souverain Anniversary has a polished titanium case that’s 40mm in diameter, while the crown and chronograph rocker are 18k red gold. To match the case livery the dial is ruthenium-plated, giving it a dark grey tone, while the numerals and markings are in copper-coloured print. While the ordinary Centigraphe has a solid dial, the anniversary edition has transparent sapphire dials for each chronograph register, a feature taken from the Centigraphe Sport that reveals the gears and levers for the chronograph. Capable of measuring up to a 1/100th of a second, hence the “Centigraphe” label, the dial records 1/100th of a second on the register at 11 o’clock. The sub-dial at two o’clock records elapsed seconds, while that at six records the minutes. Mechanically the Centigraphe Souverain Anniversary is identical to the regular version, powered by the hand-wound calibre 1506. Like all F.P. Journe movements, the calibre 1506 has the bridges and main plate in solid 18k rose gold. While all the Centigraphe Souverain Anniversary watches are identical, each boutique’s version will be distinguished by the name of its home city engraved on the case back beside the serial number. The number made for each boutique will vary, with the series starting in early October 2016 with 20 pieces for the Hong Kong boutique, followed by 10 pieces for the Tokyo store. Geneva follows in April 2017, then Paris, Beijing and New York in 2018, Bal Harbour a year later, followed by Miami in 2022, Los Angeles in 2023, and finally Beirut in 2024. F.P. Journe has yet to determine the cumulative number that will be produced, but the total number of watches for the first four cities to have their own a Centigraphe anniversary edition – Hong Kong, Tokyo, Geneva and Paris – will be 55. Available only at F.P. 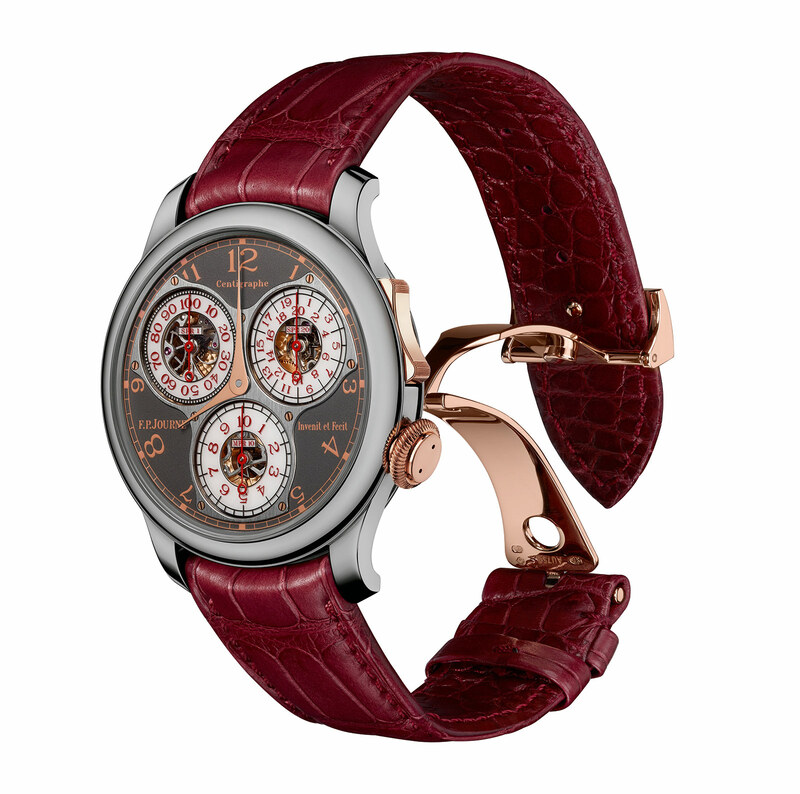 Journe boutiques, the Centigraphe Souverain Anniversaire is priced at SFr62,600 before taxes, equivalent to about US$63,900. Addition October 7, 2016: Production quantity until mid-2018 of 55 watches added.